It’s a Friday afternoon in late January and I’m working in the back office of a convention centre in the Swiss Alps. Through the window I can see a breathtaking scene that wouldn’t look out of place on a Christmas card: snow-covered mountains towering majestically against a bright blue sky. At my desk, I’m watching a live stream from the stage not 50 metres away; US Secretary of State John Kerry is giving a moving address about combating violent extremism. I’m busy scribbling notes and making time code references; I have one hour to distill his talk into a blog post. 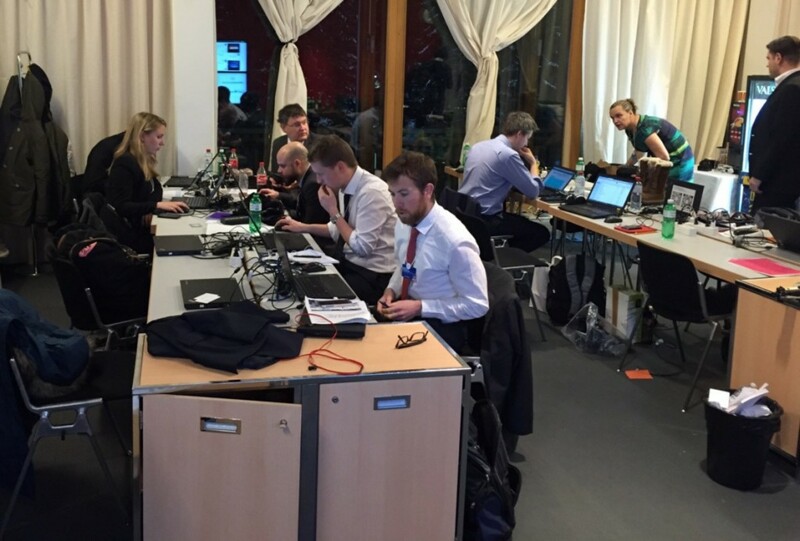 This is all happening behind the scenes in a ‘digital media command centre’ at the 45th annual meeting of the World Economic Forum in Davos. In addition to the hordes of global media that descend on the alpine town every year, the Forum has its own in-house digital team, creating content for its blog, Agenda, and sharing posts, videos, quotes and images via Twitter, Facebook and Instagram (including posts in Spanish and Mandarin). It’s an impressive team working on content creation including a roving video journalist who’s using an iPhone 6+ to rapidly shoot and upload interviews. There are also posts on Medium and alerts via the Yo messaging app. Working embedded in a team like this is a new experience for me. Usually I’m hired to tell stories as an outsider standing on the edges; my detachment from the subject provides the value. Here I’m ensconced within the Forum team for six days in what is a formidable cross-media content factory. 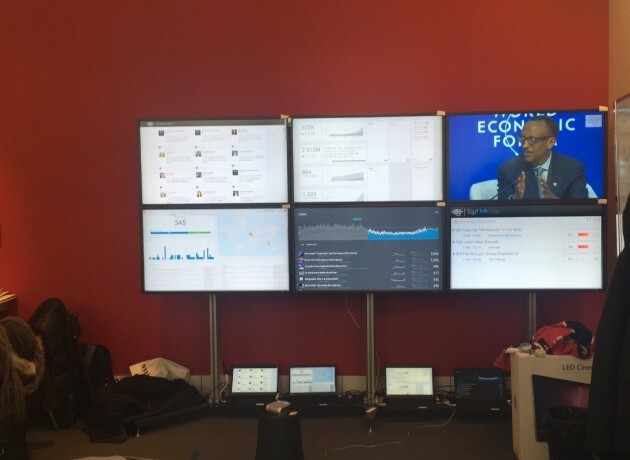 This is real-time content creation like you’ve never seen it before — a busy, buzzy field newsroom, creating, cranking and sharing content, whilst a grid of screens displays real-time analytics so we can see what’s getting traction in an instant. It may be a different setup to what’s usual for me, but my process for telling a story remains the same: explore > listen > capture > create > edit > share > measure. But things happen fast here, in Davos the pressure is on to communicate the story accurately but also rapidly. Davos often suffers from a perception problem, that it’s a place where the “1%” global elite get together for a bonding session. The reality is very different. This year climate change, poverty and gender parity are high on the agenda. Amongst the academics, NGO representatives and social entrepreneurs are names such as Oxfam’s Winnie Byanyima, Rwanda’s President Kagame and Tim Berners-Lee. It feels a long way from the idea of a privileged few chatting over canapés and champagne. So there’s an opportunity — and a need — for the Forum to tell their side of the story, and to do that direct-to-audience, instead of relying on outsiders — journalists and commentators — to get the message out. Welcome to ‘disintermediation’ — cutting out the middleman to tell the story directly, ‘creating and using your own content to build a voice’. It requires organisations to relinquish ownership of their content and to share it in the public domain. Online, the World Economic Forum tells its story by passing the microphone around to a bunch of different voices, publishing those voices on Agenda, highlighting areas of the Forum’s work that the audience might not traditionally associate with them, such as the global gender gap. Making the content more gettable and accessible means it reaches new audiences. Agenda is a year-round publishing operation, but for these six days in January its regular output is boosted by content specific to what’s happening in Davos. And it seems to be working. 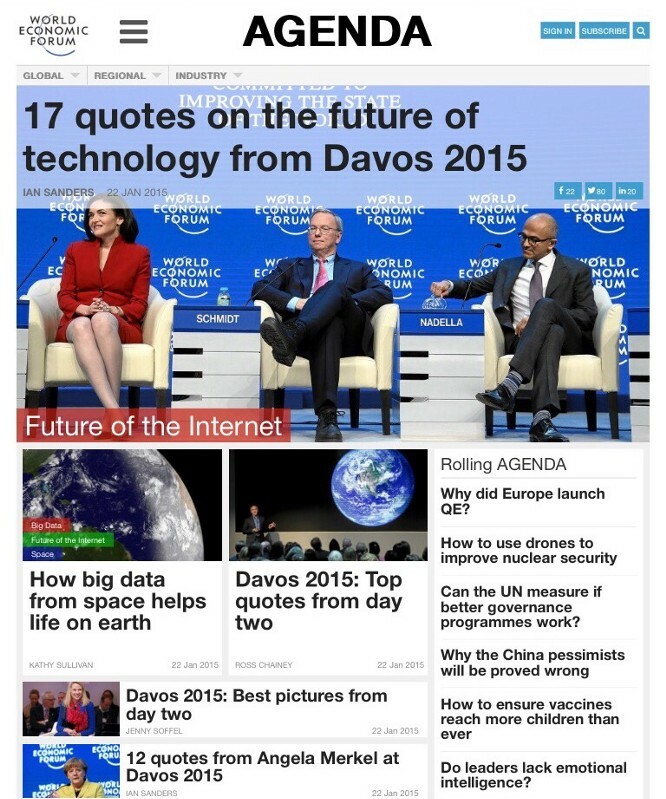 During Davos week 375 posts were published on Agenda with a million plus visitors and over three million page views. Author: Ian Sanders is a creative consultant, business storyteller and writer. Image: World Economic Forum 2015: View of Davos.